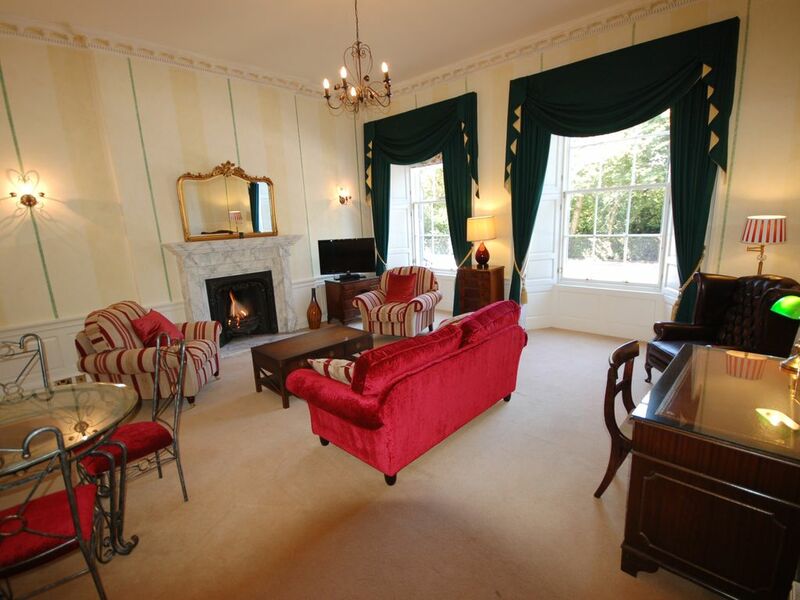 The ground floor apartment (no 1) has a similarly impressive living room with working fire and has the added feature of an early 19th century wall mural. The kitchen is well equipped and includes a dishwasher and washer/dryer. The stylish bedroom faces the quiet rear of the building. Please note that the shower room is accessed from the bedroom. The apartment overlooks the private Queen Street Gardens for which a key is provided. This is a peaceful haven in the middle of the city centre with manicured lawns, mature trees and an array of beautiful flowers and shrubs. There is small lake with an island in the gardens which is reputed to have given Robert Louis Stevenson (who lived on the other side of the gardens when he was a boy) the idea for his book 'Treasure Island'. If you require parking please let us know. We can provide a parking space a short walk away, subject to availability, for an additional charge. Full-size Miele washer with combined dryer in kitchen. Meter parking is available on Queen Street and it is possible to load and unload on the street. A full size secure garage with water, electric light and power is situated 400 meters approx away on Gloucester Lane. This can be made available AT ADDITIONAL COST IF REQUIRED. Siemens 12 place 'whisper-quiet' dishwasher. 3 ring electric induction hob plus large high-output gas ring suitable for wok. The very large, private though communal garden, is accessed using the key provided in the flat is directly across Queen Street. This flat occupies the Drawing Room (1st) floor of what was a Georgian gentleman's 18th Century Town House. The property was fully renovated in 1998 and our flat has been continuously improved by us since we bought it in 2001. Stunning town house Flat. Great location in New Town. So many great restaurants to choose from. What a fantastic town house flat in New Town. Only a few minutes walk to the Royal Mile. Lots of room to spread out. The bed was so comfortable. My wife and I had the best nights sleep. We will most definitely want to stay at 33 Queens Street again when we return to Edinburgh. Great location, close to sights and lots of great restaurants. Very well appointed flat. Perfect location, an easy walk to the historic sights. Because it is not in old town, there were lots of fantastic restaurants within 2 blocks that were actually frequented by locals. Although it fronts on a busy road, the bedroom is in the back and is very quiet at night. The area felt very safe and the apartment secure. Francois made check in simple and gave us great information on the area. I would definitely stay here again if I went back to Edinburgh, and would recommend it to friends. Rarely do you find a place without something being an issue, but this place was faultless and perfect to stay. Quiet, close to everything, and spacious. We spent a week in Edinburgh and this flat was the ideal home away from home! All the amenities one could need and plenty of space to unwind at the end of a busy day. Beautiful park view and convenient to reaching all parts of the city. Wonderful restaurants and shops just around the corner. We'd definitely look to stay here on our next trip to Edinburgh. Very comfortable stay for our party of three. My 14 year old daughter slept comfortably on the sofa bed in the living room. It’s on a busy street, but the shutters block the road noise. Queen Street Gardens were lovely. Overall, a splendid place to stay while visiting Edinburgh. This flat is located on central Queen Street in Edinburgh's historic New Town just a 3 minute walk from Princes Street. This is right in the city centre so all the city's main attractions, bars and restaurants are right on your doorstep. We will 'meet and greet' you at the property, show you around and answer any of your questions. We are also contactable during your stay should you have any queries (we live a few doors along so we are always handy). All these services (including the cleaning at the end of your stay) are included in the rental rate.